Transition Mar Vista/Venice: Work? Or Party? How about both! Work? Or Party? How about both! Our recent Work Party on 1/28/2012 dedicated to learning how to make a Rain Barrel Overflow Rain Garden was a bountiful success! Since the project was a "hybrid" of active and passive urban rainwater harvesting (active catchment in tanks combined with passive diversion into a basin) there were many learning opportunities for the 17 volunteers who attended. Since building community is a key Transition principle, the "connecting" or "party" aspect of the day was planned with as much care as the work component. Luckily, the project was a joint venture between Transition Mar Vista/Venice and Transition Culver City which meant many helping hands from planning stages to clean-up! The frontyard's hardscape with its two decks encouraged social cross-pollinating: Since the actual work area was narrow, volunteers frequently rotated out of the work zone to visit and lounge on the cool shady deck. The adjacent sunny deck (beautifully abloom with jasmine!) was a popular place to sit and browse through the collective library of gardening, permaculture and Transition books. Plus the food! Homebaked banana nut muffins and tea in the morning and a beautiful organic vegetarian lunch of pita wraps & greek salad with lemonade was appreciated by the entire crew. But back to the work component! 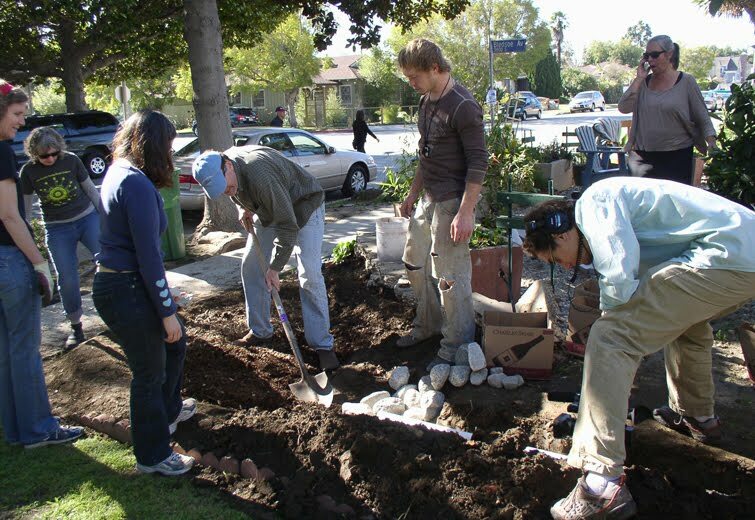 The project was coordinated by landscape architect John Tikotsky, an advocate of the Transition movement here in L.A.. John smoothly kept the volunteer crew moving from task to task and also took advantage of naturally unfolding teaching moments. Transition friend Paul Herzog of Surfrider Foundation also came with shovel in hand to work as well as share about Surfrider's Ocean Friendly Gardens program. According to Paul, urban runoff is a primary source of ocean pollution. The OFG program teaches homeowners how to apply "CPR" (Conservation, Permeability, and Retention) to their garden to help revive our local watershed and ocean. Whenever rainwater can be diverted from a residential roof into a designated area, it helps our ecosystem by replenishing the local aquifer. In this case, the designated unresolved landscape area became a mulch pit fed by the overflow from rainwater tanks. The day began with helpers plunging into the heavy labor: digging & sculpting the reservoir and berms to create a passive groundwater recharge zone. Thanks to the previous weekend's heavy rains, digging the mulch pit went quickly and smoothly; in less than an hour, a lovely shape emerged from what had previously been a flat sloping hardpan surface. The crew also made a trench to hide the subsurface diverter pipe. Later, cobblestones were placed at the mouth of the diverter for a lovely babbling brook effect (next time it rains!) and the reservoir was filled with mulch. With this simple and natural passive rainwater collection technique, the homeowners are now able to slow down the rain and let it soak in on the spot instead of flow downhill to the street. Since this family opted for some unusual vertical "water wall" storage tanks instead of the classic rain barrels, the project became an engineering puzzle for the group as they figured out how to daisychain the elevated tanks, create the pvc angles and drill the overflow diverters into place. There were many unexpected spontaneous teaching moments such as how to glue pvc pipe w/ epoxy, how to pour a concrete footing so that wood is not in contact with the soil, and how to use a level to assure best gravity flow. John Tikotsky also provided attendee's with a guide on how to calculate your own roof's water-catching capacity. Additional site-specific challenges — what to grow? The area where the new reservoir and berms reside is directly under a swath of deep shade from the parkway magnolias. Over the years the homeowners had found this downhill slope to be stubbornly unplantable. But thanks to the efforts of the volunteer work crew, the space is now leveled off with a nicely mulched reservoir for water retention. The plan was to plant edibles into the berm surrounding the mulch pit. But what kind of native CA edibles can handle such deep shade? Research revealed that in the wild, currants & gooseberries (Ribes family) thrive and bear fruit under oak tree overstories. Though currants and gooseberries are a popular fruit in Europe they are largely overlooked as an edible in the U.S. Now the beginnings of a golden currant food forest is growing in east Mar Vista! A great big thank you to all who helped make this happen—we couldn't and wouldn't have done this without you! Stop by any time to survey your hard work. And we'll definitely let you know when it's time to bake some currant tarts!